(This report is dedicated to Michel and his dog Axel, who are at the eve of a new life together. I wish them both good luck). Finally, after five months, I could make it again and pay our Knuti-boy a visit. So, very early on Thursday morning, I prepared the last things for the trip and felt miserable. Thought by myself, Oh no, out of question, not the right time now, I do not want to become sick because I want to go to Berlin. And off we went. During the train trip, I tried to sleep and to drink coffee as much as possible. But nevertheless, there was a monument I wanted to see again or at least to have a better look at and promising myself that this time I would finally learn what it is or was? Eight hours later, I arrived in Berlin Main Station and while waiting for the little train to bring me to Zoologischer Garten, all of a sudden, I knew that I was really back. On the ground, next to my feet, there they were, six little lovely and lively sparrows. When I was a child, there were still thousand of them around my parents’ house and when I moved into my little house in Leuven, there were plenty of them here in my garden and if I could not see them, then at least I could heard them quarrelling all the time. So, sometimes one is having the feeling that certain things will never end until the day – about 10 years later – that you realize that they were all gone. I did no longer see them and certainly, not hear them. Now, during the three last years, I am the proud “owner” of sparrows in my garden, well, there are about 9 or so. Needless to say that I invent whatever I can to feed them during Winter in such a manner that the cats cannot reach them (and if I am allowed to say so, for such things, I have a rather good fantasy). So, when I saw these cuties in Berlin, they warmed the heart and gave me somehow the feeling of coming home. After the check-in, I ran straight to the Zoo (of course, what else !!) and finally, I was standing in front of this young bear and was really amazed by his size. Of course, I could have know that he must have been grown, but this much ????? But nevertheless, he is still a lovely and, most of all, a beautiful animal. OK, I promise you all that I will not repeat these words every three sentences or so, but you will all admit that I had to say it once and that it is not a lie. Another joy was meeting Auntie Christina again. And very importantly, she gave me some instant lessons with respect to my new camera (remember the previous times I was in Berlin, I always borrowed and used the camera of one of my colleagues). When you visit a zoo during Winter time, there are advantages and disadvantages. Advantage is that you have all space, disadvantages are the early closing and the fact that a lot of the animals are in the stables or not reachable and then the weather is also very important. In my case, it was a bit of a mixture with respect to all of these things. By the way, I think it was in Knuts Blog that I learned about the book written by Dr. B. Blaszkiewitz “ Knautschke, Knut & Co” and I always had the intend to buy it some day. Well, this is what I did on my first day. And I can warmly recommend it. It is not really cheap, but worth every single Euro cent. The lady in the office was a bit worried because it is only edited in German, but even for people like me, whose German is rather poor (after all, it is my fourth language), it is written in a very fluent comprehensible language, the stories are – of course – wonderful and the pictures are simply amazing. And while reading it, the things that stroke me the most are the love and pride of this man for his Zoo and its animals (even though he is also having his favourites - but hey, he is a human being like we, no?). OK, during the night, I got a serious fever and barely slept (and remember, I am extremely stubborn), but believe it or not, next day at 9 o’clock I was in the Zoo. And who was the first to visit, yes indeed !!! Well, maybe I have been dreaming or maybe I was still feverish and therefore hallucinating, but this is what happened. We were about five people and a horse head or so standing in front of his enclosure, better said, the glass shield (that was completely frozen), in other words, all Berliners and an outsider, again in other words, four people and the famous horse head on the one side and me alone on the other. And what happened? Knut was coming to my side and paying me all attention. At that moment, I decided, why should I speak a foreign language and talked to him in my own mother tongue (but silently) and walked up and down. And … he followed me and did not even look at the others. MAANNN, how lucky can you be? OK, nobody has to believe my words, but I swear that this is what happened and by the way, did I already say that I truly adore this young animal (almost as much as my cats and that is a very precise indication of my love), that he is soooo good looking? Funny anecdote of that day, I went to see the big polar bears and when I arrived at their enclosure, I saw the Ladies, but where was the Lord of the House? As they say in Dutch “Niet te vinden”. So, I started to make the tour around their enclosure and then I notice a young girl (Azubi) who was apparently doing the same. I went to her and asked her where Lars was. And you know what she replied ????? “Well, actually, we don’t know, we don’t see him either”. Ätsch, I think that when you miss an adult polar bear in your enclosure, you might have a little problem, no? But the rascal has hidden himself in a corner and then in such a way that you could only see him when he wanted that. A few minutes later, he was there of course, because Marcus Robke (hopefully, this is the correct spelling of his name) was there and Lars then immediately appeared again and looked at us as if he wanted to say “Cool down, please”. 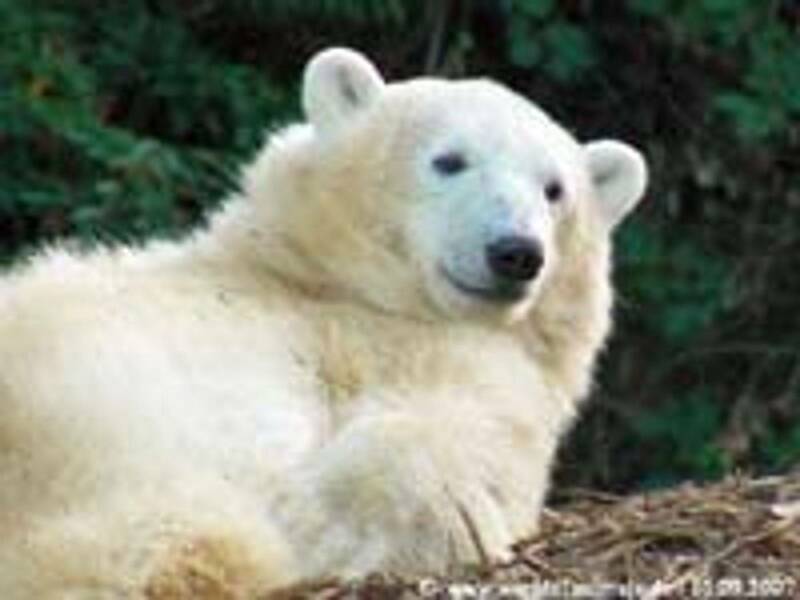 Have I already said that he is a beautiful polar bear.? Another anecdote, during the course of that day, I met other Knutians and you know what I did? During the feeding of Knut, I was standing next to Gertraud and I said some words and sentences in German. You know, I have been training this already for months (on my own of course), but never dared in real public, but since I know that Gertraud is such a lovely person, I forgot about my nerves and did it. And apparently, it did not sound like whatever tongue of outerspace, but more or less German, because she replied in German (WAAAWWW, I was proud of myself at that moment, but most probably, next time, I will need some wine or so). And again another anecdote, his time, I also went to the Kinder Zoo, well, may be, it is not such a good place for me. You are allowed to feed the animals there, on the condition that you put coins in an automat. OH YEAH, that is really the thing I need !!!! I started to run around to change my coins for smaller ones and by now, I believe that I must be the best friend of the goats (but not of my wallet, never realized that money was leaving me soooo fast, so it ended up with the fact that I had a serious word with myself – can you imagine ? No, well, I cannot either, but I know one thing for sure, luckily, the Zoo is rather empty in Winter, otherwise I certainly would have met “the men in white coats”. Saturday was simply GREAT. While I was standing there to see Knut, all of a sudden, in the corner of my eyes, I saw somebody coming nearer, somebody I never met before and yet gave me a familiar feeling. And there she was --- Annemarie. We said “Good morning” and watched Knut. Most probably, most people would call me an extremely under-cooled person, because I do not give kisses or so (well, at least not to humans, but my cats can not complain). And then Evi also arrived (missed her when I was there in August even though we barely said a word to each other, but glad to see her back now). And then, all the people I know had something to do and went their way and so did I (and I think it is good like this, because it is never laying a burden to somebody and is respecting everybody). And so, it came that after a while when I came back to Knuti’s enclosure, I met Viktor (so far there were only “written contacts” and all of a sudden “personal contacts”, well, it is always adding something to life). So we started talking and walking around (may I say that it is always very interesting to meet people who are living in Berlin, because then you have the opportunity to learn). OOOOUUUFF, just re-read these sentences and they make no real sense, but they don’t have to, do they? By the way, I also visited the little pekari’s, but I hope that you all (and me included) are happy that somebody else (Viktor/Yeoman/Spreewaldmarion ????) is going to make pics of them, because all of mine failed (blurries)). Later on Saturday evening, Annemarie and I went to an Italian restaurant (recommendable, thank you Dumba because you learned Annemarie about it). And were talking about one billion things (not a problem at all with me, you know). On Sunday morning, I was really having only 10 minutes of Knut and then I had to rush to the station to catch my train. - I once signed the petition “Knut forever in Berlin” and I will not apologize for this or even regret it. I simply did it. - I know that it is very selfish and most probably I do not use the right words now: But: if I could make a wish, I would wish that Knut could stay, but then in a better and large enclosure and with good company, because by now, I know the way to Berlin (I know perfectly well that these words have nothing to do with Knut or his well-being, but only with we, so to all those who disagree, read my words again before reacting, Thank You). - I realize by now that maybe Knut cannot stay in Berlin. But as long as I can visit him by taking the train, I will continue to visit him (you must admit, that there is no big difference between a travel time of 8, or 10 or 12 hours). - I am becoming scared for Knuti, because his sometimes endless walking up and back (Sorry, in Dutch, we call this “rusteloos heen en weer lopen”) reminds me too much of his own mother Tosca. And if you watch his eyes, they are empty at that moment. They are not fixed at whatever point. Well, this was my fifth visit to Knut and my first report in Knuts Blog (because I was not having a computer of my own and considering the circumstances, also my last). But I hope it was not my last visit to Knut. And yet, if I may say so, why do I have the feeling that Knut is not leaving Berlin. All good solutions are still available and present in Berlin; where the sparrows are. Dieser Bericht ist Michel und seinem Hund Axel gewidmet, die am Vorabend eines neuen gemeinsamen Lebens stehen. Ich wünsche den Beiden viel Glück. Endlich, nach 5 Monaten ist es mir wieder gelungen, unserem Knuti-Jungen einen Besuch zu machen. Sehr früh am Donnerstagmorgen habe ich die letzten Dinge für meine Reise vorbereitet und mich miserabel gefühlt. Ich habe gedacht: Oh nein, keine Frage, es ist nicht die richtige Zeit, ich will nicht krank werden, ich will nach Berlin fahren. Und ich bin gefahren. Auf der Zugfahrt habe ich versucht zu schlafen und habe so viel Kaffee wie möglich getrunken. Aber dennoch, es gab ein Denkmal, das ich wieder sehen wollte oder wenigstens einen besseren Blick darauf haben, und ich habe mir selber versprochen, dieses Mal zu erfahren, was es ist oder war. Acht Stunden später kam ich am Hauptbahnhof von Berlin an, und während ich auf den kleinen Zug wartete, der mich zum Zoologischen Garten bringen sollte, wusste ich plötzlich, dass ich wirklich zurückgekommen war. Am Boden, ganz nah bei meinen Füβen waren 6 schöne, lebendige Spatzen. Als ich ein Kind war, gab es bei meinem Elternhaus Tausende von Spatzen, und als ich in mein kleines Haus in Leuven zog, waren dort sehr viele. Wenn ich sie nicht sehen konnte, konnte ich ihnen wenigstens beim Streiten zuhören. Manchmal hat man das Gefühl, dass gewisse Dinge niemals zu Ende gehen, bis zu dem Tag – ungefähr 10 Jahre später – bemerkte ich, dass alle verschwunden waren. Ich konnte sie nicht mehr sehen und hören. Nun, seit ein paar Jahren bin ich die stolze Besitzerin von ungefähr 9 Spatzen in meinem Garten. Es ist unnötig zu sagen, dass ich im Winter Gründe erfinde, um sie zu füttern, und zwar so, dass die Katzen sie nicht erwischen (wenn ich mir erlauben darf, das zu sagen, für solche Dinge habe ich eine ziemlich gute Fantasie). Als ich also diese süβen Geschöpfe in Berlin sah, wärmten sie mein Herz und gaben mir das Gefühl nach Hause zu kommen. Nachdem ich eingecheckt hatte, bin ich direkt zum Zoo gelaufen (natürlich, was denn sonst!! ), und endlich stand ich dann vor diesem jungen Bären und habe mich über seine Größe gewundert. Natürlich hätte ich wissen können, dass er gewachsen war, aber so viel??? Trotzdem ist er noch immer entzückend und vor allem ein schönes Tier. Okay, ich verspreche euch, dass ich diese Worte nicht in jedem dritten Satz wiederholen werde, aber ihr alle werdet zugeben, dass ich das zumindest einmal sagen musste, und es ist keine Lüge. Und dann habe ich mich sehr darüber gefreut, Tante Christina wiederzusehen. Und vor allem hat sie mir sofort wichtige Hinweise zum Benutzen meiner neuen Kamera gegeben (erinnert euch doch an meine vorherigen Besuche in Berlin, bei denen ich mir ständig die Kamera eines meiner Kollegen ausgeborgt habe). Ein Zoobesuch in der Winterzeit hat seine Vor- und Nachteile. Ein Vorteil ist der, dass man sehr viel Platz hat, ein Nachteil, dass der Zoo früh schließt und sich viele Tiere in den Ställen aufhalten und nicht erreichbar sind. Auch das Wetter spielt eine wichtige Rolle. In meinem Fall war das Ganze eine Mischung aus allen diesen Dingen. Übrigens, ich glaube, dass ich in Knuts Blog von dem Buch “Knautschke, Knut & Co.” von Dr. B. Blaszkiewitz gelesen hatte, und ich habe mir immer vorgenommen, es irgendwann zu kaufen. Das habe ich an meinem ersten Tag auch gleich gemacht. Und ich kann es wärmstens empfehlen. Es ist keineswegs preiswert, aber jeden einzelnen Euro wert. Die Dame im Büro hat sich etwas Sorgen gemacht, weil es in nur in Deutsch ist, aber sogar für Leute wie mich mit ihrem ziemlich schlechten Deutsch (schließlich ist das meine vierte Sprache) ist es flüssig und verständlich geschrieben. Die Geschichten sind - natürlich - wundervoll und die Bilder einfach erstaunlich. Und während des Lesens ist mir vor allem die Liebe dieses Mannes für seinen Zoo und die Tiere und sein Stolz darauf aufgefallen (obwohl er seine Favoriten hat, aber hey, schließlich ist er ein Mensch wie wir, nicht wahr?). Okay, in der Nacht bekam ich hohes Fieber und habe kaum geschlafen (und erinnert euch, dass ich ein großer Dickkopf bin), aber glaubt es oder nicht, am nächsten Tag war ich um 9 Uhr im Zoo. Und wem galt mein erster Besuch? Genau!!! Na ja, vielleicht habe ich geträumt oder hatte immer noch Fieber und habe halluziniert, aber folgendes ist passiert. Vor seinem Gehege oder besser gesagt, vor der Glaswand (die total zugefroren war) standen ungefähr fünf Leute. Mit anderen Worten, alles Berliner und ein Außenstehender, das heißt, vier Leute auf einer Seite und ich ganz allein auf der anderen. Und was geschah? Knut kam zu meiner Seite rüber und widmete sich ganz allein mir. In diesem Moment dachte ich, warum soll ich eine fremde Sprache sprechen? Also habe ich in meiner Muttersprache geredet (aber still) und bin hin- und hergegangen. Und … er ist mir gefolgt und hat überhaupt nicht auf die anderen geachtet. Maaannn, wieviel Glück kann ein Mensch haben? Okay, niemand muss mir Glauben schenken, aber ich schwöre, dass genau das passiert ist. Und übrigens, habe ich schon mal gesagt, dass ich dieses junge Tier anbete (fast genauso wie meine Katzen, und das sagt so ziemlich alles über meine Liebe aus), und dass er sooo gut aussieht? Ätsch, ich denke, wenn man einen erwachsenen Eisbären vermisst, dann hat man ein kleines Problem. Aber der Schlingel hatte sich in einer Ecke versteckt, und zwar so, dass man ihn nur sehen konnte, wenn er das wollte. Einige Minuten später war er natürlich wieder da, weil Marcus Röbke dort stand. Und Lars tauchte sofort wieder auf und schaute uns an, als wenn er sagen wollte: „Bitte regt euch wieder ab.“ Habe ich schon gesagt, dass er ein wunderschöner Eisbär ist? Eine weitere Anekdote an diesem Tag ist, dass ich andere Knutianer getroffen habe. Und wisst ihr, was ich gemacht habe? Bei der Fütterung von Knut stand ich neben Gertraud und habe einige Worte und Sätze in Deutsch gesagt. Wisst ihr, ich habe das seit Monaten geübt (für mich, natürlich), aber in der Öffentlichkeit hatte ich das noch nie gewagt, aber weil ich weiß, dass Gertraud eine solch reizende Person ist, habe ich meinen Mut zusammengenommen und es gemacht. Und offensichtlich hat es nicht wie irgendeine Sprache aus dem Weltall geklungen, sondern mehr oder weniger wie Deutsch, weil sie auch in Deutsch geantwortet hat. (Ach, war ich in diesem Moment stolz auf mich, aber wahrscheinlich werde ich beim nächsten Mal Wein oder sowas brauchen). Der Samstag war einfach GROSSARTIG. Als ich da stand, um Knut zuzuschauen, sah ich plötzlich aus dem Augenwinkel jemanden näherkommen, jemanden, den ich noch nie getroffen hatte und der mir trotzdem ein vertrautes Gefühl vermittelte. Und da war sie - Annemarie. Wir haben uns guten Morgen gewünscht und Knut beobachtet. Wahrscheinlich würden mich die meisten Leute als unterkühlte Person bezeichnen, weil ich keine Küsse verteile (na ja, zumindest nicht an Menschen, aber meine Katzen können sich nicht beklagen). Und dann kam auch Evi (als ich im August dort war, habe ich sie verpasst. Wir haben kaum ein Wort miteinander gesprochen, aber ich habe mich gefreut, sie zu sehen). Und dann hatten alle Leute, die ich kannte, zu tun und gingen ihrer Wege. Ich habe das auch gemacht (und ich denke, das ist gut so, weil man niemandem zur Last fallen möchte und jedermann respektiert). Und nach einer Weile, als ich zurück an Knutis Gehege war, habe ich Viktor getroffen (bis zu diesem Zeitpunkt kannten wir uns nur schriftlich, und ganz plötzlich war der persönliche Kontakt da). Wir haben dann miteinander geredet und sind herumgewandert (ich muss sagen, dass es sehr interessant ist, Leute kennenzulernen, die in Berlin wohnen, denn dann hat man die Gelegenheit zu lernen). Uff, ich habe diese Sätze gerade durchgelesen, und sie machen nicht wirklich Sinn, aber das müssen sie auch nicht, oder? Übrigens habe ich auch die kleinen Pekaris besucht, aber ich hoffe, dass ihr alle (ich auch) glücklich darüber seid, dass irgendjemand anders (Viktor/Yeoman/SpreewaldMarion???) Fotos von ihnen schießen wird, weil meine alle nichts geworden sind (verschwommen). Später dann, am Samstagabend, sind Annemarie und ich in ein italienisches Restaurant gegangen (empfehlenswert, danke, Dumba, weil du Annemarie davon erzählt hast). Und wir haben uns über eine Milliarde Dinge unterhalten (kein Problem für mich, müsst ihr wissen). Am Sonntagmorgen blieben mir nur zehn Minuten für Knut, und dann musste ich eilig zum Bahnhof, um den Zug zu erwischen. - Ich habe damals die Petition „Knut forever in Berlin“ unterschrieben, und ich entschuldige mich nicht dafür und bedaure es auch nicht. Ich habe es einfach getan. - Ich weiß, dass es sehr egoistisch ist und ich finde sehr wahrscheinlich auch nicht die richtigen Worte: Aber, wenn ich einen Wunsch äußern könnte, dann würde ich mir wünschen, dass Knut bleiben könnte. Dann aber in einem besseren und größeren Gehege und mit guter Gesellschaft, weil ich mittlerweile den Weg nach Berlin kenne (ich weiß sehr wohl, dass diese Worte nichts mit Knut oder seinem Wohlbefinden zu tun haben, sondern nur mit mir. Diejenigen, die damit nicht einverstanden sind, mögen meine Worte noch einmal lesen, bevor sie reagieren. Danke). - Mittlerweile habe ich begriffen, dass Knut vielleicht nicht in Berlin bleiben kann. Aber solange ich ihn mit dem Zug besuchen kann, werde ich ihn weiterhin besuchen (ihr müsst zugeben, dass es keinen Unterschied macht, ob man nun 8 oder 10 oder 12 Stunden reisen muss). - Ich weiß im voraus, dass ich, wenn er Europa verlassen muss oder an einen Ort gebracht wird, an dem ich ihn mit dem Zug nicht erreichen kann, bitterlich weinen und im Web forschen werde, ob es irgendwo Neuigkeiten von ihm gibt. - Ich habe langsam Angst um Knuti, weil mich sein manchmal endloses Hin- und Hergelaufe (sorry, auf Holländisch nennen wir das “rusteloos heen en weer lopen”) zu sehr an seine Mutter Tosca erinnert. Und wenn man seine Augen beobachtet, dann sind sie in diesen Momenten leer. Er richtet sie auf keinen bestimmten Punkt. Nun, das war mein fünfter Besuch bei Knut und mein erster Bericht in Knuts Blog (weil ich keinen eigenen Computer hatte) und angesichts der Umstände wohl mein letzter. Aber ich hoffe, es war nicht mein letzter Besuch bei Knut. Und doch, wenn ich das sagen darf: Warum habe ich das Gefühl, dass Knut Berlin nicht verlassen muss? Gute Lösungen gibt es in Berlin noch immer - dort, wo die Spatzen sind.